The complimentary Concierge Service was the first of its kind in the real estate industry, developed in 1996, provides clients with an elite service that no other local real estate company provides. The complimentary Concierge Service was the first of its kind in the real estate industry, developed in 1996, provides clients with an elite service that no other local real estate company provides. This service makes buying and selling a home easier because Concierge has vendors in a wide variety of service categories including movers, home repair, and improvements, as well as utility transfer and hook-up. 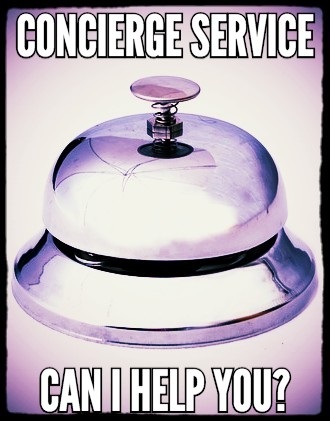 Concierge provides customers peace of mind knowing all vendors have been pre-screened and met stringent qualifications. * Time-saving because Concierge has already spent time prescreening to ensure the vendors are licensed, insured and in good standing. * Peace of mind because it relieves you from liability by not having to make vendor recommendations. * Convenience because it is a one-stop shop for a variety of home resources accessible 24 hours a day, 7 days a week. Service providers have all been pre-screened to ensure they are appropriately licensed, experienced, and insured for the type of work they are offering. Performance agreements are also signed to maintain the highest standards of ethics and professionalism. Don't worry, you are in good hands as Coldwell Banker Concierge relies heavily on references. Remove yourself from unnecessary risk by accessing the qualified professionals of ConciergeService.com. No registration or fees required to access the provider’s information. * Bonded: All vendors that require bonding in the state of California must provide verification that they have been bonded per the State Contractor’s License Board. * References: All vendors must provide Concierge with three recent, good client references that have been checked out thoroughly. There is also an extensive online search performed for any customer reviews. * Background Checks: Certain categories of providers are subject to criminal background checks. * All vendors fill out a detailed application and sign a legally binding contract with Coldwell Banker Residential Brokerage Concierge outlining performance expectations.